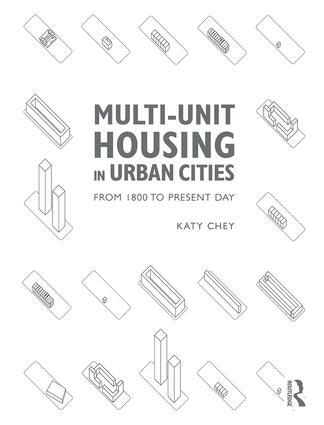 This book investigates the development of multi-unit housing typologies that were predominant in a particular city from the 1800s to present day. It emphasises the importance of understanding the direct connection between housing and dwelling in the context of a city, and the manner in which the city is an instructional indication of how a housing typology is embodied. The case studies presented offer an insight into why a certain housing type flourished in a specific city and the variety span across cities in the world where distinct housing types have prevailed. It also pursues how housing types developed, evolved, and helped define the city, looks into how dwellers inhabited their dwellings, and analyses how the housing typologies correlates in a contemporary context. The typologies studied are back-to-backs in Birmingham; tenements in London; Haussmann Apartment in Paris; tenements in New York; tong lau in Hong Kong; perimeter block, linear block, and block-edge in Berlin; perimeter block and solitaire in Amsterdam; space-enclosing structure in Beijing; micro house in Tokyo, and high-rise in Toronto. Katy Chey is an architect living, working, and teaching in Toronto. She lives in a multi-unit housing dwelling in the city.